This book addresses the issue of modern-day cynicism and how to have hope. If you are like me when I first started reading, I kind of knew what cynicism meant but not entirely. So here is a definition if you need it; cynicism is an inclination to believe that people are motivated purely by self-interest; skepticism. In the beginning, Jason addresses the issue of cynicism and how it's being celebrated in today's society. We are mistaking it for intelligence - but in reality, it's damaging our minds. As Mohammed Fairouz stated- "it is better to be wry and distrustful than to be open and trusting". The book goes into 4 main sections on how to have hope. Look Down, Look In, Look Out, and Look Up. It also goes over how we can live with hope at the end. Look Down goes into the foundation of Hope. Where can we start to have hope? What I loved that Jason wrote was the correlation between the book Lord of the Rings and hope. It helped me understand it better. Look In reminds us that one day we will walk into the gates of heaven and meet Jesus face to face. We will forever be at peace. We all face troubles and are uncertain about tomorrows future, but what we can do is have that hope of reuniting with our loved ones one day. As Dom says in Fast and Furious 7 - "it's never goodbye". Look Out reminds us that hope is happening. When we turn on the news we think that nothing good is happening. But if we take the chance to look around we can see that good is happening. We just have to look a little harder. And we can provide hope to others by serving them. Look Up focuses on the purpose of hope. That hope goes beyond the world in front of us getting better - but focusing on what Jesus promises. That one day he will return to earth and there will be no more pain and suffering. We will live in eternal peace. Until that day we can live that hope. Did it relay its intended message? 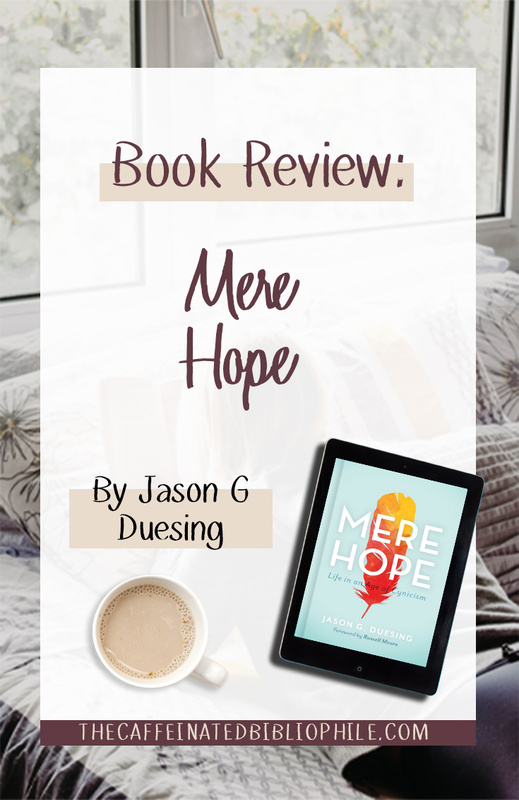 Jason Duesing had a way of writing that made it easy to understand the different parts of scripture mentioned in this book. He explained each scripture well and how it relayed to the message or meaning of that chapter. I appreciated that he gave examples of his own life experiences so that the reader can feel like they can relate. Yes, I definitely think this book is great for any Christian asking the question, how can we have hope in the midst of this worlds cynicism. I think this would also be a great book for those new to Christianity. I think for the most part (at least I remember doing so) new Christians have asked the question- why does God allow bad things to happen? This book address that question- and in an easy and relatable way. Jason G. Duesing is vice president for Strategic Initiatives and assistant professor of Historical Theology at Southwestern Baptist Theological Seminary in Fort Worth, Texas. He is also a co-editor and contributor to First Freedom: The Baptist Perspective on Religious Liberty and Upon this Rock: The Baptist Understanding of the Church. Despite of all the missfourtunes happening, how do you have hope that things will get better one day? Share in the comments! Note: I was provided a copy of this book by B&H Publishing to review. All opinions are my own.